It is hard to believe it has been a whole year since the last Vinitaly but life seems to have a way of speeding up as you get (a little bit) older, as some of you may have noticed. 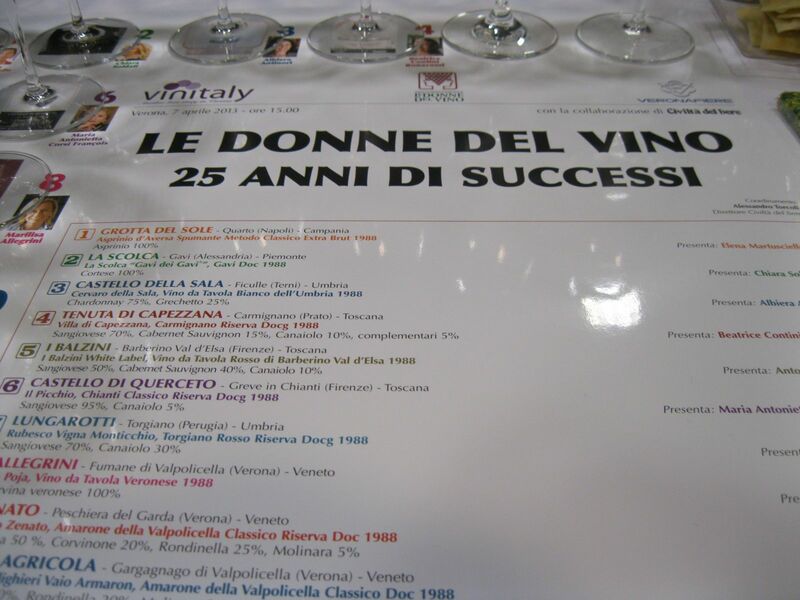 In any event, this post is about the 25th anniversary of the organization Le Donne del Vino, even if this is their 26th year. The organization which began in 1988 started as the brainchild of Elisabetta Tognana and today has 650 members. I first heard about the organization when I began seriously studying Italian wine in Milan in 1997. I did my first women in wine interviews in 2005 when Pia Donata Berlucchi was the President of the group. Thanks to this long standing interest in the group, I was invited by Alessandro Torcoli of Civilta del Bere to one of his seminars at Vinitaly last year dedicated to the organization. 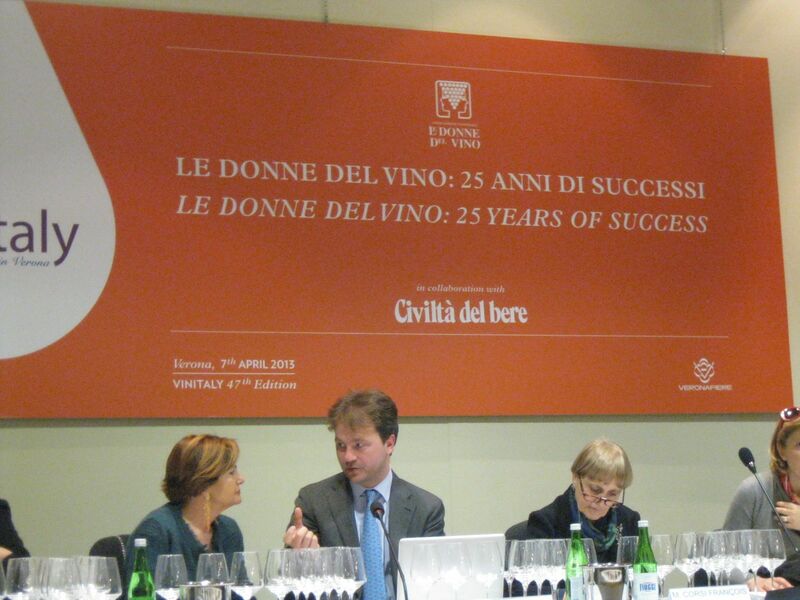 Civilta del Bere always organizes one or two seminars during Vinitaly. I must say that they have often been highlights of my trip to Verona. This will be my ninth Vinitaly and every year I seem to find more to do at the fair between tastings, seminars, meeting clients and friends, tasting wine with sommeliers at the regional desks in each pavilion not to mention the other areas of Vinitaly such as Sol and Enolitech, Vivit and the new ViniBio section this year. The tasting was fabulous and the wines were as well. Each wine was also from 1988, the year the organization was founded. Ten women and their wines were part of the tasting. Each of the women described how their wineries were part of what they brought to the table and how the importance of certain values for each played into their work in the wineries: family, sustainability and culture. Wine is more than just wine was the theme. They also spoke about how women are used to multitasking in their daily lives and how this translates into their work in the vineyards as well. We stated out with the wines from Grotta del Sole (Napoli) with Elena Martusciello, President of Le Donne del Vino since 2010. The winery was created in 1989 and is active in the areas known as the Campi Flegrei D.O.C., Penisola Sorrentina and Aversa. The family has been interested in the revival of grape varieties that were out of favor or moving towards extinction. The winery also was the first in Campania to make a sparkling wine using the Classical method and the Martinotti method (charmat). The winery has 42 hectares plus two additional properties of 4.5 hectares and 7 hectares. Martusciello is very active in the cultural life of her community as well, working to promote the heritage of the Campi Flegrei. We tasted a wine called Aspirino d’Aversa Spumante Metodo Classico Extra Brut 1988. It was a lovely example of this grape which I have tried in a still version in the past. The wine was a deep, golden color with a citrus tart bouquet. It was a semi-dry wine which was full-bodied on the palate with nice acidity and alcohol, nutty, fruity and yeasty flavors with minerality and sapidity. It has a very long finish and made me want to have seafood right away. Marusciello said they wanted to make a sparkling wine because Campania didn’t have any at that point. Apparently her brother-in-law, an Oenologist had studied in Conegliano (Veneto) and became obsessed with sparklers as it is the land of Prosecco. Her son also is quite passionate about sparkling wines so the traditional will definitely continue. Here’s an article I wrote about in the early days of my Italian Indigenous Varieties series on Aspirinio. The next wine we tried was from Chiara Soldati from La Scolca. It was a Gavi dei Gavi, Gavi DOC 1988. Scolca became part of the Soldati family between 1917-1919. Chiara is at the head of the winery and has been since she was very young, together with her father Giuseppe. At the time of the acquisition, the family decided to plant the white Cortese grape which was a big shift from the traditional plantings of the area which were all red. Chiara is the fifth generation to run the winery. Chiara spoke about her family winery and the emotions that she felt towards the industry. She is also very active in her local area both in terms of academics where she teaches in a Masters programs as well as promoting the area as a tourism mecca with the Movimento Turismo Vino. The wine, a Gavi dei Gavi DOC 1988, was a deep, lemon color with a persistent, tropical and dried fruit bouquet. On the palate, it was dry, full-bodied with great acidity, waxy and lanolin flavors with almond notes and again, mineral overtones. The wine was first made in 1975 and undergoes a partial maceration with the skins as well as lees aging. The next wine was from Castello della Sala, a winery of the Antinori family. Albiera Antinori presented the wine. She is part of the 26th generation of this family which has been in the wine business for 600 years. Albiera is one of three sisters. Allegra and Alessia are the other two and all three work in the family business. The Antinori group has 1,700 hectares in Italy and 540 hectares in other nations (USA, Hungary, Chile and Malta). Albiera is the oldest of the three sisters and has been working for the company since 1986. She has held various positions throughout these years including the recent project developing their new mega headquarters in Tuscany. Speaking of her experiences in the industry, she said she felt it was actually harder to be a young person than to be a woman. Interesting comment. The wine we tasted was the Cervaro della Sala, VdT Bianco dell’Umbria 1988. A blend of Chardonnay and Grechetto. According to Albiera, the wine was a real exception when it was first created. It spends time in wood and undergoes malolactic fermentation and then ages on its lees. An example of how the traditional Antinori family approached innovation and new techniques in their wineries. I have had this wine a number of times and always enjoyed it. It had a golden color with an intense, persistent nose of golden apples, honey, butter and almond. On the palate, it was dry, full-bodied with good acidity and alcohol. It had an oaky note to it as well as the same flavors that I got on the nose. The fourth wine was from the Tenuta di Capezzana and was presented by Beatrice Contini Bonacossi. Her Villa di Capezzana Carmignano Riserva DOCG 1988 is one of my favorite wines and has been since I lived in Florence. I’m a huge fan of Carmignano which I feel is woefully underrated. The winery was founded in the 1920s by Count Alessandro Contini Bonacossi who hailed from a noble family from Mantova. Beatrice’s father, Ugo, the nephew of Count Alessandro was the innovator of the winery. Since 2009, the winery has moved towards organic agriculture. Some 50% of the vineyards are now organic. Beatrice was a swimming champion as a youth and has worked with the winery since 1983. She is one of seven children of Ugo. Beatrice has been a member of Le Donne del Vino since the beginning. She said that being a woman is no longer truly an issue in the field. Her sister, Benedetta is an oenologist and her niece a member of the winery team as well. The wine, Carmignano Riserva D.O.C.G. 1988 contained a blend of 70% Sangiovese, 15% Cabernet Sauvignon, 10% Canaiolo, and 5% of other varieties. It made its debut in 1925.It was a deep ruby red with intense and persistent aromas of cherry, tobacco and oak. On the palate, the wine was dry, full-bodied with good acidity and alcohol. It had similar flavors to the aromas on the palate with more black fruit notes. 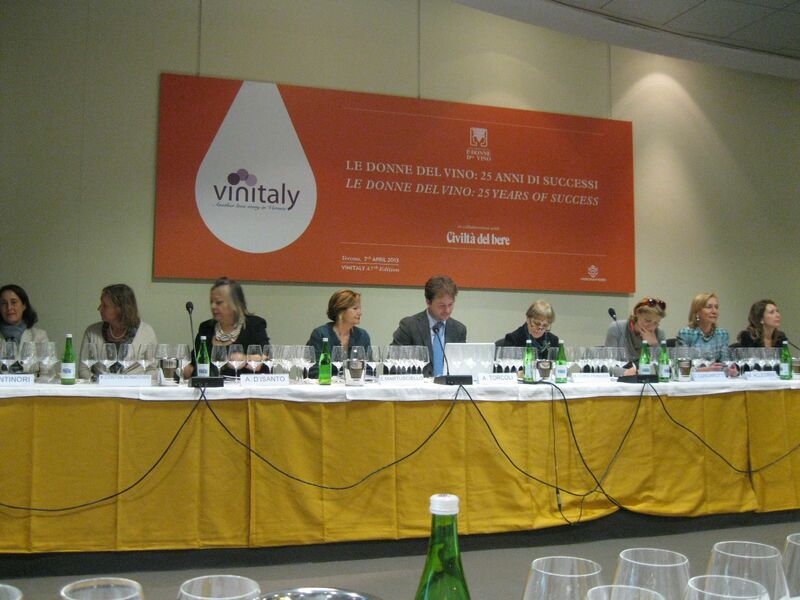 The fifth woman on the panel was Antonella D’Isanto from I Balzini, a winery in Barberino Val d’Elsa (Florence). The winery was bought by her husband, Vincenzo D’Istanto, in the 1977 and planted in 1980.Barbara Tamburini, a wonderful oenologist and a personal friend is their consulting winemaker. Antonella has been heavily involved in the winery since 2005 and in a project called Tuscan Colors which has different colors for each label. Originally from Messina, I spent some time with Antonella outside of the seminar and she was truly lovely to speak with, warm and generous. In addition to everything else, she makes jewelry from corkscrews and gave me a great pair of earrings during the fair. She is very interested in sustainability and theirs was one of the first wineries to have photovoltaic structures in the vineyard which covers 80% of their energy needs. Carbon zero is a goal for the winery. In addition to the wines they make, Antonella has included other products in their lineup including wine gelatin. The wine we tried was called I Balzini White Label, a VdT Rosso di Barberino Val d’Elsa 1988. It was ruby red in color with intense and persistent aromas of animal skin, earth and savory notes. On the palate, it was dry, full-bodied with alcohol and acidity. The tannins were gritty with rich, fruity flavors and again a distinct earthy note in the background. It had a long finish as well. I’m going to finish the second part of the tasting in a separate post tomorrow. As you can see, each woman and each wine was fascinating. 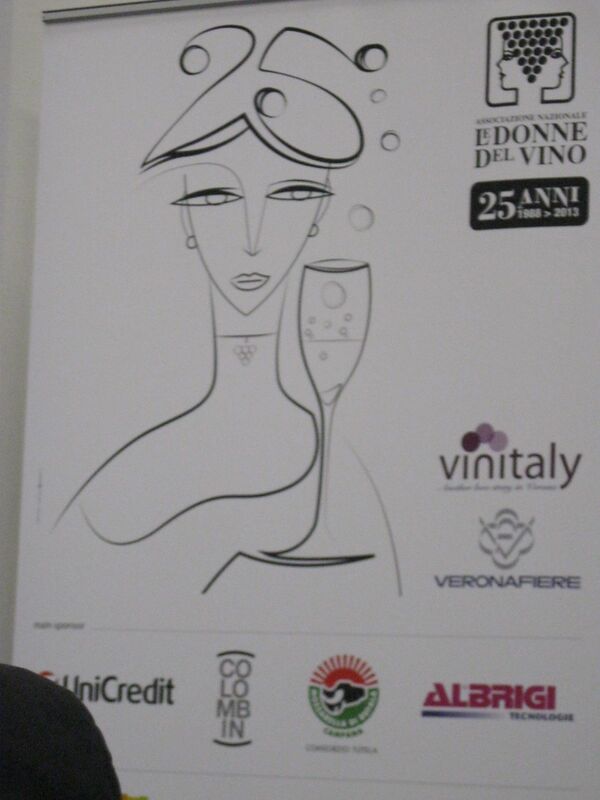 On International Women’s day I thought I would republish these two posts I wrote about the Italian organization le Donne del Vino. It will be their 29th year this year. I think it’s a good time to celebrate them.